Alto Lago is a unique concept. The spectacular lake, landscaping, grand avenues and monumental access create the perfect scenario for an innovative project with top-notch architectural design. Discover the magic of a new life-style. Surround yourself by nature where you can take part in recreational, artistic and sports activities that will awaken your senses to new experiences. ALTO LAGO is a one-of-a-kind residential development inspired by great resorts. 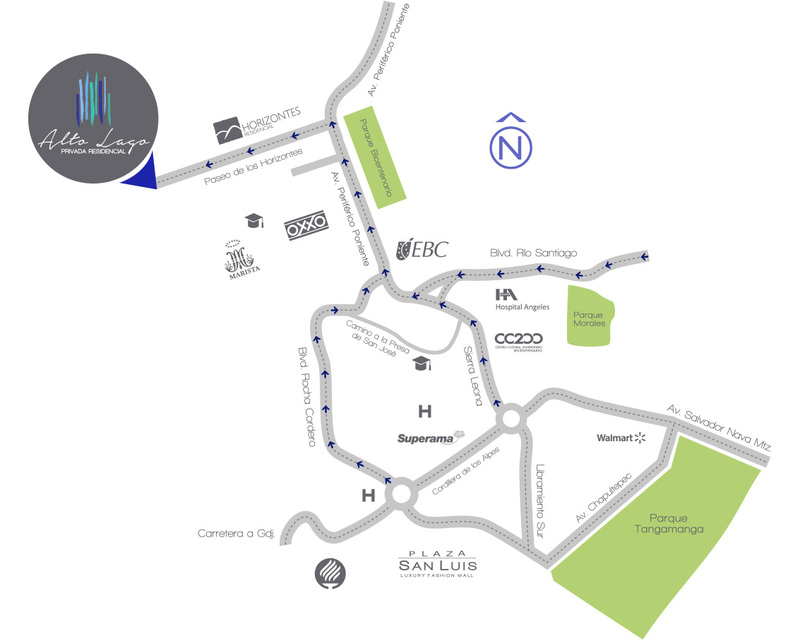 It has two controlled entries that lead to a wide avenue, along which you’ll find the Canto del Agua path where you can enjoy the beautiful landscape that leads to the heart of the complex: La Casa del Lago. Once inside the complex, you’ll find nine cul-de-sacs, each with fewer than 40 lots, most of which face green areas. We’ve also planned for apartment buildings with exceptional views and amenities that promise a year-round vacation. ALTO LAGO offers the opportunity for lots of activities for the whole family. You can take a walk, meditate or read in the Zen garden, watch a movie outdoors or spend time with your pet in the dog park!. DON’T IMAGINE IT! EXPERIENCE IT! Your private information will be treated and is protected by the Privacy Statement published at www.habi.com.mx. This ad is for publicity purposes; the photos are for illustrative purposes used only as a reference. The specifications and illustrated characteristics may be changed without prior notice.